From Protection and Utility... to Performance and Style! ADD-ON is a locally-owned, family business that started in rural Vermont in the early 1970's. We grew up with the automotive aftermarket accessory industry, and our connections run deep. Once one of the largest wholesale distributors of automotive accessories in the country, now the largest full-service Accessories and Installation Center in Vermont, the outlet store we run today continues to offer the low prices and industry knowledge that made us Vermont's favorite auto accessory shop! We pledge to offer honest and courteous service for our customers while supporting our community and providing stable, meaningful employment for our team members. 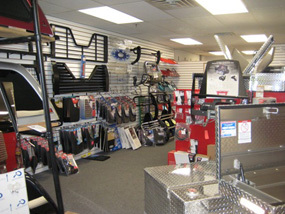 ADD-ON Accessory Outlet has the largest automotive accessory showroom in the Northeast. We know you want to see your accessories before you buy – that’s why we have even more in stock in our warehouse. Call or stop by with your vehicle to talk to one of our professional Accessory Assistants. We’ll help you find what you’re looking for, even if we have to order it for you. Most orders arrive in one to two business days. ADD-ON also has a state-of-the-art Installation Center staffed by our factory-trained, experienced technicians. We offer same-day installation on most in-stock accessories. Drop off your vehicle for the day, or wait in our Customer Lounge with cable TV and open WiFi. At ADD-ON, installation labor is always warranted for as long as you own your vehicle. Many installations also come with extended product warranties – at no extra cost to you. That’s the ADD-ON Advantage. © Copyright 2016, ADD-ON Auto Accessories. All Rights Reserved.